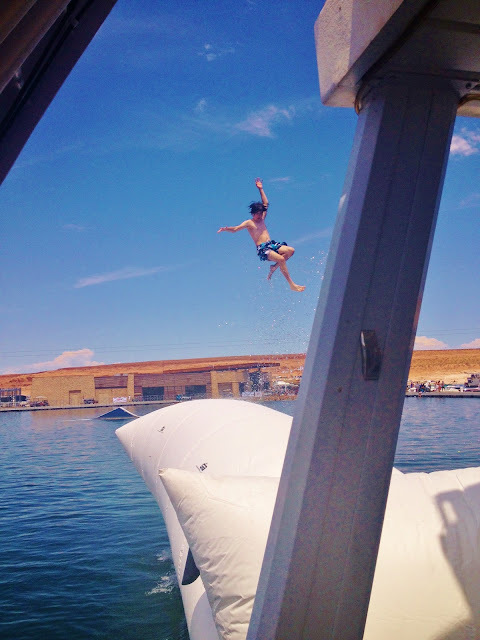 The third Preliminary event concluded on July 20th at Lake Powell’s “Summer Sickness Series – Wakeboarding at The Point” as a record number of riders showed up for $1,000 cash prize and a tons of swag for participants and category leaders. Competitors in this event were automatically prequalified to enter the event finals on August 31st for a chance to win $5,045 provided by Guidance Aviation of Prescott, Arizona. That’s BIG MONEY. The FINALS, taking place on August 31st, promise to go even bigger as event organizers and promoters will be getting the crowds involved in the event with “Best Catches Off The Dock” as well as tons of swag giveaways. Finals on August 31, 2013. Spectators will also have a chance to win some serious swag. She can not only catch big air off the blob, she won the ladies wakeboarding division. That’s Destiny Bennett! She also won Best Trick in Women’s & Masters. Nicely done Destiny, we’ll see you on August 31st!! This guy brought his skim board to demo, nice! Take off sideways, land sideways, oooooo ! So why is Guidance giving away “$5,045”??? Because Guidance Aviation was the FIRST Part 141 high altitude helicopter flight training school in the U.S. with flight training operations based at an altitude of 5,045′ feet above sea level. Learn to fly in the challenging environment of high altitude, and you can fly anywhere your career takes you! Schools in Prescott, AZ. and Baton Rouge, LA. Gotta love the “Peace” ! Awesome air on this one! Cutting hard, this guy was out to win…. Another perfect day at Lake Powell ! AUGUST 31st FOR THE FINAL AT THE SUMMER SICKNESS SERIES – WAKEBOARDING AT THE POINT !